Michael Adair, CEO Predictions of a “retail apocalypse,” at the hands of disruptors like Amazon and eBay, have long been overstated. If there’s anything to learn from Amazon opening a retail store in Seattle, or many online-first retailers such as Warby Parker and Bonobos establishing physical stores and “fitting shops” of their own, is that the brick-and-mortar retail is here to stay. That’s why retailers are leveraging tech-driven solutions such as artificial intelligence (AI), machine learning, and data analytics across in-store and e-commerce operations as countermeasures to level the playing field and better compete with pure play e-tailers. And it is precisely why Silicon Valley-based Deep North is helping retailers understand the in-store customer journey to deliver the most engaging experience in order to reclaim consumer traffic and share of wallet from the digital world. The story of Deep North’s inception goes back to 2016, when the two co-founders, Rohan Sanil and Jinjun Wang, brainstormed various strategies for optimizing customer traffic to overhaul retail operations. Back then, the company was registered as VMAXX, as a derivative of maximizing the video content available. The idea was to use existing security camera and in-store monitoring equipment to deliver powerful video analytics that aid retailers with planning, predicting, and maximizing profits. However, sustenance of consumer traffic at retail stores seemed all the more difficult with the emergence of e-commerce businesses. "We are entering an era of physical and digital convergence, and we are at the center of that convergence"
Consumers started moving toward online stores which offered more convenience plus a broader portfolio of items, sizes, and styles to choose from, resulting in less traffic at physical store fronts. Further, retailers failed to understand what their customers actually wanted, why customers would visit a store and not make purchases, and what customers felt after visiting a particular store—all things that are common data points for e-tailers. Despite their steady efforts, these retailers struggled to accurately capture the conversion rate of visits-to-purchases made by customers. E-commerce, on the other hand, leveraged data analytics to showcase, promote, and properly stock products based on both actual and predictive customer preferences. What if the same could be realized for a physical store? “Engagement, experience, customer behavior, and demographic data are tracked pixel by pixel in the digital world. Now, with AI, video analytics, and computer vision, we empower retail stores with the equivalent knowledge about the in-store customer journey, allowing them to strategize their offerings for better sales conversion rates,” explains Adair. Deriving actionable content and metrics from these technologies, Deep North’s solutions solve one of the quintessential problems in the retail space—nurturing and sustaining higher consumer traffic that results in greater overall yield. Object detection is at the heart of Deep North’s solutions. By utilizing cameras and surveillance equipment, Deep North’s solutions track and trace individuals entering or leaving retail store premises to effectively understand their interactions with the products on display. This allows stores to learn the magnitude of customer traffic, products that the customers are interested in, and the sales conversation ratios, thereby aggregating the required metric data that was previously unavailable. One of Deep North’s recent client interactions highlight the value it delivers not only to retail stores but customers as well. A telecom retailer had spent millions of dollars on displays to engage customers and increase sales. During the initial implementation, they found out that only 16 percent of the customers stopped near the displays, accounting for lower engagement than expected. Collaborating with Deep North, the retailer implemented video analytics to track customers and determine the optimal positions for displays that were in line with customer traffic. Once the retailer moved the displays to locations which attracted the highest levels of customer attention, it resulted in an engagement gain of 200 percent and significantly increased sales conversion. Since Deep North utilizes a firm’s existing infrastructure and security cameras to derive these metrics, both the system implementation and ROI is immediate. Deep North’s solution can also evaluate customers according to their age and gender, providing an anonymized hashed ID to each individual without collecting personally identifiable information (PII). The hashed ID enables retailers to learn about their loyal customers, and then utilize the data to develop more predictive and reliable ways of retaining them. Through this demographic data, retail operators can understand the brands that interest their customers most and suitably optimize the store’s product offerings. Additional applications for these software-based solutions include alerts to cashiers when the checkout line is long to re-allocate staff to billing counters to effectively mitigate the traffic. The software also keeps track of the available inventory in a similar manner; if an area in the store is experiencing high traffic, the system sends an alert to the staff to check the inventory level. Deep North, which is hardware-agnostic, recently introduced the element of emotions into its video analytics solution. 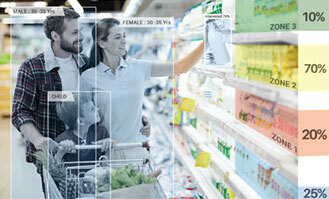 Using computer vision, the solution studies the reactions of customers when engaging with products and the store environment to determine whether they are happy, sad or neutral. These insights, in turn, help retail stores create a congenial and hospitable environment for customers and better understand their preferences. “We are entering an era of physical and digital convergence, and we are at the center of that convergence,” adds Sanil, co-founder and VP of products, Deep North. Since its establishment, Deep North has consistently enhanced and elevated its innovation, delivering a wholesome experience to customers visiting brick-and-mortar stores while helping retailers leverage metrics beneficial to their marketing strategies. The firm has catered to the requirements of various industries such as fashion, restaurants, grocers, pharmacies, big box and home furnishings / improvement, where engagement plays a vital role in determining sales conversion. Deep North’s work with one of its clients, a shopping mall, illustrates the critical nature of such engagement. The mall had found that it needed to understand the flow of customer traffic at various locations to determine the cost of renting or leasing shop spaces. As there were different entrances to the facility, pricing of retail spaces available for lease was dependent on customer traffic. Using Deep North’s video analytics and computer vision expertise, the shopping mall conveniently optimized the pricing of all its retail spaces. The mall’s existing video equipment allowed Deep North to effectively determine the traffic pattern, the most preferred entrance and exit, and the number of people walking by each store. These insights allowed the client to maximize their revenue and obtain the highest value out of the available space. Numerous such accomplishments have made Deep North a preferred video analytics and computer vision solutions partner for some of the most well-established and emerging retailers, alike. “Every security camera in the world can leverage AI, computer vision, and deep learning to benefit consumers and retailers in various endeavors, and our solutions bring about the much needed retail renaissance in today’s digital revolution,” adds Wang, the company’s co-founder and CTO. Deep North is expanding its solutions portfolio to deliver customer alerts and allow clients to monitor unusual customer behavior patterns within shops for security and operational efficiency. From a geographical standpoint, the company aims to expand its presence across European and Middle Eastern countries, aspiring to reach out to a larger demographic. CEO Michael Adair terms their developments as providing “AI for the physical and retail worlds,” empowering clients to maximize their investments through video analytics that elevate customer engagement as much as the bottom line.